Ok, yes, it’s a blatant rip-off of Carl Zwanzig’s famous quote about duct tape — and I offer humble apologies for this — but it really is kinda true. And in my opinion, the misuse of governance frameworks has contributed greatly to the idea that it’s all about rules, restrictions and constraints that make running your business more difficult than you’d like it to be. But it really doesn’t have to be this way. Really. So, what might your organisation look like if your governance framework is being used for evil, rather than good? Rules are all very well when they keep you on the right track. But they need to leave you open to taking advantage of opportunities that appear along the way. Or trying new things. Or changing tack completely in response to market conditions. When your rules lock you into a rigid path, it will always lead to darkness. I’ve worked with a few organisations that have become caught up in rules to their own detriment. One was engaged in a funding agreement which stipulated that anything developed as a result of activity performed under the agreement belonged to the funding body. This included products, services, and IP. There were many long conversations within the organisation about not being able to develop anything new, because they perceived that the organisation ostensibly wouldn’t be able to make use of its own smarts. This was a very strict interpretation of the agreement. True, the IP belonged to the funding body, but there were many good reasons to enter into discussions about licensing and other opportunities to utilise the IP to provide much broader benefit. The lesson here is that, although your agreements and contracts form part of your governance framework, they are ultimately secondary to the vision and purpose of the organisation. It’s important to avoid creating unnecessary boundaries that dictate your activities — especially when they are being made by a third party who is just buying services or products. In another organisation, board meetings were dominated by effusive apologies and explanations from the CEO about poor budget performance. While everyone was caught up frowning and wringing their hands at the disappointing bottom line (the past), no-one around the table looked ahead to the things that might lead to growth (the future). By focussing on how to fix a perceived problem, the Board was ignoring opportunities that might have led to growth (which may have fixed the problem!). If your governance framework focuses first on compliance and outputs, and forgets impact and outcomes, you’ve definitely fallen into shadow. Compliance is just a hygiene measure. It’s not the Holy Grail. Being compliant means you can tick the boxes to show you are meeting your legal, social, and environmental obligations. It gives you no competitive advantage — it’s the minimum requirement for your license to operate. As for outputs, well, they can be a little bit deceptive. They look remarkably like you’re getting stuff done. Delivering hundreds of instances of service, or producing many, many widgets can look and feel like achievement. But you can be making lots of products and helping a whole bunch of people without actually accomplishing the fundamental purpose of your organisation. Making sure your governance framework is aligned with your values, purpose, and strategy will keep you away from the dark side. Do you feel like there are lots of bottlenecks in your organisation? Super complicated approvals processes? Do only the most senior people have any authority to sign off on things? Maybe you have overly complex systems that don’t even make sense? 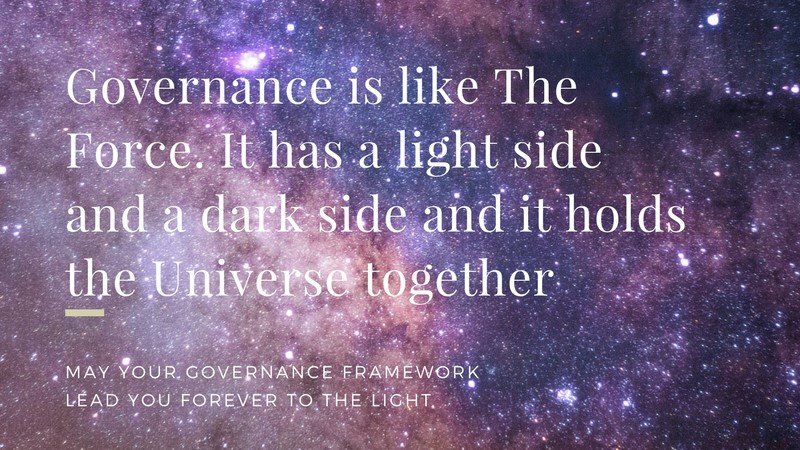 When systems, processes and policies make it difficult to get things done, it’s often an indicator that your governance framework has slipped over to the Dark Side . The danger of this kind of red tape is that people won’t even bother trying to get things done, because it’s just too hard. Or, people will come up with their own workarounds that potentially put the organisation at risk. A good governance framework makes sure that authority is delegated to the appropriate levels and that processes smooth the way to getting stuff done — not hold it up. Do you ever hear your senior managers saying things like, “it’s a great idea, but the Board will think it’s too risky”? Or perhaps the example above rings true for you: “the funding agreement doesn’t allow it”. Or how about “why do we need to change, we’ve always done it this way”. Yep — that old chestnut mostly likely originated in an organisation that had Dark Side corporate governance and no appetite for anything new (and it most likely no longer exists or soon won’t). Complicated and restrictive governance frameworks smother out-of-the-box thinking and risk-taking culture, squandering opportunities for growth and innovation. A framework built by a Light Side governance professional will embed mechanisms for building a culture that supports and rewards innovation and sets appropriate boundaries for safe risk-taking. How does your organisation stack up? Is your governance framework shining a guiding light for your organisation? Or is it looking a little shadowy and dead-end-ish?